18ct White Gold Fitted Wedding Ring with Baguette Cut Diamonds — Form Bespoke Jewellers Ltd.
A bespoke wedding ring, cast in white gold with baguette diamonds. This is a lovely example of how a “fitted wedding ring” can be created to look as though it was always part of a matching engagement and wedding ring set. The width and main profile of this wedding ring is the same as the engagement ring. Then, a bespoke cut-out has been created on one edge of the wedding ring which allows for the main diamond of the engagement ring to slot neatly into it. Two baguette cut diamonds have also been hand set into the band of the fitted wedding ring, perfectly mirroring the engagement ring. 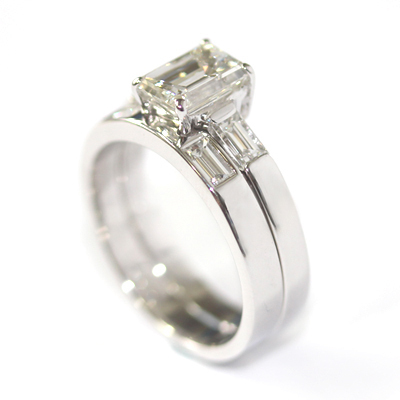 All the diamonds are of the same colour and clarity to ensure that there is a balanced finish across both rings. 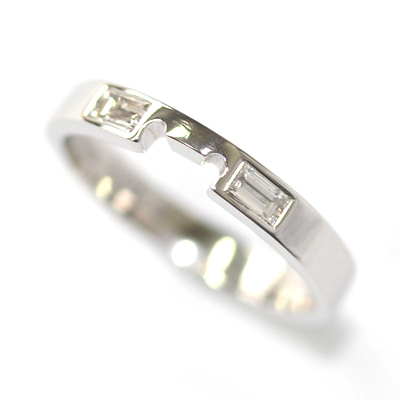 A perfect match, white gold diamond set fitted wedding ring.